Research & Education Association, 9780738609713, 296pp. Are you crunched for time? 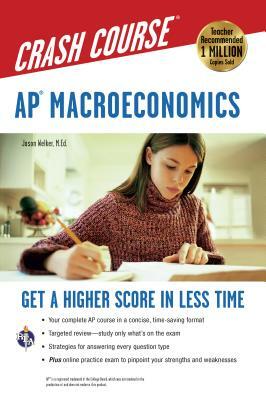 Have you started studying for your Advanced Placement(R) Macroeconomics exam yet? How will you memorize everything you need to know before the test? Do you wish there was a fast and easy way to study for the exam AND boost your score? The Crash Course is based on an in-depth analysis of the AP(R) Macroeconomics course description outline and actual AP(R) test questions. It covers only the information tested on the exam, so you can make the most of your valuable study time. Our easy-to-read format gives you a crash course in: basic economic concepts, economic performance, inflation, price determination, unemployment, economic growth, and international trade and finance, and more. The author also includes must-know key formulas and definitions all AP(R) students should know before test day. Whether you're cramming for the test at the last minute, looking for extra review, or want to study on your own in preparation for the exams - this is the study guide every AP(R) Macroeconomics student must have. Jason Welker teaches economics to nearly 100 students from 40 countries each year. Jason writes a blog for Economics students around the world which can be read at www.welkerswikinomics.com. He has also led workshops on technology in the Economics classroom at AP(R) Summer Institutes and at the National Center for Economics Education conference in Washington, D.C. He has recently completed a textbook for the IB Economics curriculum, and is constantly developing and making available many other resources for Econ students through his website. His latest venture, Macroeconomics Crash Course, provides students with a powerful resource for use in preparation for their AP(R) exams. Jason Welker teaches economics to nearly 100 students from 40 countries each year. Jason writes a blog for Economics students around the world which can be read at www.welkerswikinomics.com. He has also led workshops on technology in the Economics classroom at AP(R) Summer Institutes and at the National Center for Economics Education conference in Washington, D.C. He has recently completed a textbook for the IB Economics curriculum, and is constantly developing and making available many other resources for Econ students through his website. His latest venture, Macroeconomics Crash Course, provides students with a powerful resource for use in preparation for their AP(R) exams.